His dream had always been to become a member of this weird wintertime club. There the astrophysicist sat, in the Antarctic, as the thermometer approached the negative 100 mark, and climbed into the sauna for 10 minutes. Right afterwards, he ran a few hundred feet around the South Pole, dressed only in shoes and a mask. With that, he became a member of the “300 club”, which gets its name from the temperature difference of 300 degrees between the 200 degrees of the sauna and the negative 100 degrees outside. That was one of only very few variations during one of the toughest jobs in science. Emanuel Jacobi persevered at the Amundsen-Scott South Pole Station while “wintering-over”. “So much goes on at the station during the Antarctic summer,” he says. Variety is a sure thing when 250 scientists from different countries are there researching, the days are light, and five to six planes land daily. The real challenge comes during the winter. Temperatures drop to negative 100 degrees, it becomes dark for six months, and no one leaves the station. Jacobi recounts, “no one can leave and no one comes.” Around 50 people held down the fort with Jacobi during that winter eight years ago. The environment is extremely inhospitable. “You just look at the landscape and see only snow and ice, there is nothing green, nothing grows or flies,” recalls Emanuel Jacobi. The station is located on a high plateau over 8,850 feet above sea level and a good 620 miles away from the coast. There was a clear task for Jacobi, currently working at DESY (Deutsches Elektronen-Synchrotron) in Zeuthen, Brandenburg: He had to keep the IceCube Neutrino Observatory running. 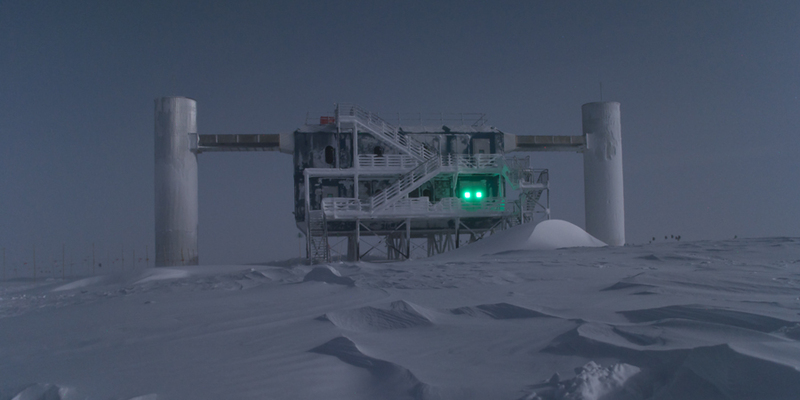 The IceCube is the world’s largest particle detector. Around 5,100 light detectors observe muons and other particles that fly through the one-cubic-kilometer detector over one mile below ground. “One way that the light-emitting muons are formed is when high-energy neutrinos interact with ice molecules,” explains Jacobi. A clear medium is required to measure this weak light: ice. This is why the leading institution in the world’s most advanced telescopes, the University of Wisconsin-Madison, installed the technology in Antarctica. The scientists hope that the IceCube will provide insights about where the cosmic rays that make the neutrinos come from. The now 39-year-old's job was clearly outlined. He needed to manage the computer farm, perform maintenance on the detector hardware, repair broken equipment, archive data on magnetic tapes, and check whether the over 1,000 indicators examined were constantly being recorded. “The detector must always deliver data and be online,” says Jacobi, no matter what it takes. Getting spare parts delivered to the South Pole is out of the question. Important information could be lost if the servers crashed or if the hard drives broke down. If he could not fix a problem using the software from within the warm station, he had to go outside. And that implied walking more than half a mile from the station to the IceCube in the complete darkness of the polar winter along a route lined with flags. The crew members organized an educational program to fight loneliness and depression. In their spare time, an American colleague and passionate helicopter pilot taught Jacobi the theory lessons for getting a helicopter license. Others offered introductory Thai classes, the group rehearsed plays, a ham radio was created, and many got into photography and recorded short films. “Anyone who would always go to their room to watch a DVD every evening had a much harder time during the winter,” explains Emanuel Jacobi. And since the inhabitants were left to fend for themselves, everyone had to take on a security-related duty. This meant that Jacobi had to be the fireman from time to time, including a weekly fire drill. People even signed up to cook and wash dishes for the voluntary kitchen services on Sundays. Science calls these effects on the mind, which occur in such an extreme environment, the winter-over syndrome. Emanuel Jacobi learned what this meant first hand, “you do things significantly more slowly, social interactions are different, and my memory got worse, for example.” It was difficult for him to formulate longer sentences or to concentrate. It was clear to Jacobi that people who have not experienced this can hardly understand what it is like in the Antarctic. “You are on a completely different wavelength,” he says. That is why experts advised him to take a short break after the South Pole winter before returning to family and friends. He listened to them and flew to New Zealand and Australia, enjoyed dearly-missed sushi, and sat in the botanical gardens in Christchurch. “The best part was smelling the flowers, enjoying the green surroundings, and breathing in moist air,” he says. Afterwards, he met up with his girlfriend in Hong Kong and they went travelling around Asia for three months. He is convinced that, “you should do something together after such a long time apart.” It was important not to go straight back into daily life in Germany with all those emotions and feelings.